First Line: I sat there in the car with the gravel dust blowing across the parking lot and saw the place for what it was, not what it was right at that moment in the hot sunlight, but for what it had been maybe twelve or fifteen years before: a real general store with folks gathered around the lunch counter, a line of people at the soda fountain, little children ordering ice cream of just about every flavor you could think of, hard candy by the quarter pound, moon pies and crackerjack and other things I hadn't thought about tasting in years. Told in alternating chapters from three different viewpoints, A Land More Kind Than Home is a strong mystery, a lyrical evocation of place, and a heartbreaking family story. An elderly woman named Adelaide Lyle introduces us to the little flyspeck of a town about an hour north of Asheville, North Carolina, and its church with the papered-up windows. Why doesn't Pastor Carson Chambliss want anyone to see inside the old storefront that houses his church? And why did such a deeply religious woman as Adelaide Lyle stop attending? We next hear from Jess Hall, a little boy fervently attached to his older brother, and finally the local sheriff, Clem Barefield, shares what he knows. The focus of this book starts out soft and misty, but as we learn the story from these three people with their vastly different ages and life experiences, that focus sharpens dramatically-- and a feeling of dread begins to grow. One of the things I enjoyed most about this book was the fact that the story wasn't all spelled out for me. An old woman who doesn't get out much isn't going to see everything that goes on. A little boy may see many things that he can't understand or put words to. And a sheriff may have suspicions but no cold, hard facts to back them up. I had to piece everything together from these three narratives, and Cash's writing style made the work a pleasure. But for some strange reason, I couldn't come completely under the spell of his story or of his characters. I'm at a loss to explain it. The closest I can come is to say that I felt as though I'd read this story before. The particulars may be different, but the basic story is very familiar. Will this keep me from reading more of Wiley Cash's work? Absolutely not! 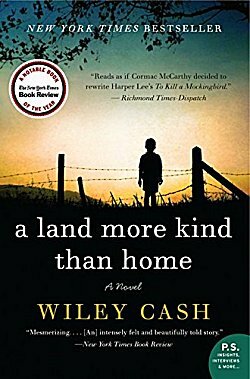 And if you're in the mood for a mystery that's strong on setting, suspense, and characterization, I urge you to read A Land More Kind Than Home. Oh, this sounds intriguing, Cathy! And I like the different perspectives. They allow the reader a sense of the story, without giving it all away at once. First line; What a long sentence! It goes on and on. Yes, I certainly noticed that! I've always been interested in this book. Does it convey a sense of that region? Are the characters interesting? Is there a reason why you didn't give it an "A"? The title of this book has always been what's drawn me in. Yes, it does convey a sense of place. Yes, the characters are interesting. Why didn't I give it an A? Because-- as I said in my review-- I'd read this story before, and this time dressing it up in a new suit made me smile, but it didn't make my toes curl.